In June 1945, barely weeks after the XBT2D-1 (aka the A-1Skyraider) had flown, Douglas was asked to submit a proposal for a similaraircraft, but this time powered by a turboprop engine. Several XBT3Dproposals were put forth, all based on the Skyraider airframe. None of them wentpast the concept stage. Douglas was later requested to develop an aircraft that wouldnot only serve as a testbed for turboprop development, but also to develop anattack aircraft using this powerplant. This would become the A2D Skyshark. Originallytwo prototypes were developed around the Allison XT-40. At first it was thoughtthat a Skyraider modification would suffice, however the power of the XT-40 wasnearly twice that of the R-3350 in the SPAD, so an entirely new airframe wasdeveloped. The XT-40 was basically two T-38 turbines that drove acounter-rotating propeller via a common gearbox. Like the Gannet, it waspossible to shut down one engine and have the aircraft fly on the other. Unlikethe Gannet, the single engine drove both props. First flight was in May 1950 and the go ahead was given for 10production aircraft. However, extreme teething problems with the powerplant andgearbox pretty well doomed the project. Though all ten production aircraft werebuilt, the last four did not fly. The development of the A4D Skyhawk spelt thedeath knell for the Skyshark and a subsequent order for 339 aircraft wascancelled. I know that there is at least one Skyshark around as I have seen itat Chino, CA in the late 1970s. As to its whereabouts, that is unknown. When it comesto real quality vacuforms, there are a few names that rise to the top. KosterEnerprises is one, so is Esoteric, and you can add to that list Dynavector. 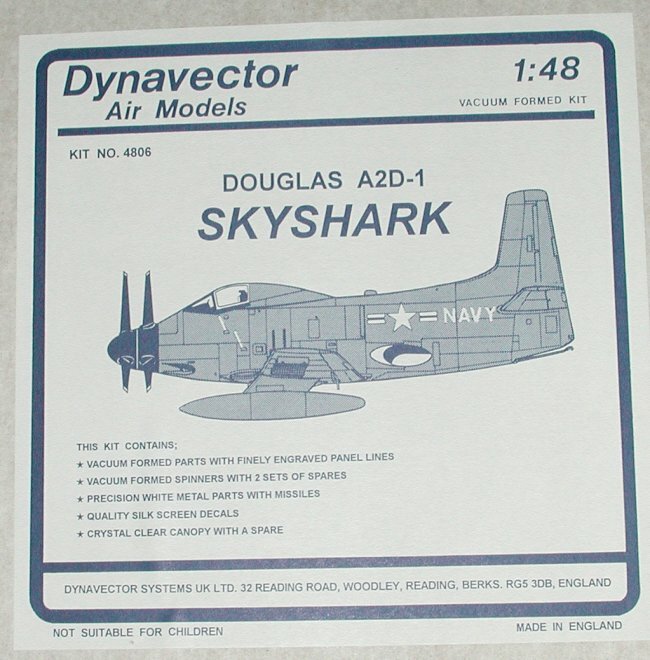 Fromthe introduction of their first kit, the Fairey Gannet, Dynavector kitshave been hailed as top-notch, top-quality kits. Every review I have read gusheswith praise about the logical engineering, the quality of the mold and thesuperb resin/metal bits that are included in the kit. So let's take a look. The first thingyou notice is that the kit comes in a nice, sturdy, cardboard box. Upon openingit, one first sees the instruction and decal sheet. Underneath are two whitesheets of vacuformed plastic. Examining the parts shows superb detail andminimal 'pips' (those small bubbles that are common to vac kits). A nice touchis an additional set of prop hubs as well as a spar for the tailplanes so youcan get the proper dihedral. Taped to the underside of one of the sheetsis a very heavy bag of metal parts. These bits include such things as rocket andracks, struts and wheels, prop blades and engine exhausts, tail hook and hookwell. In addition, there are a number of other bits for the interior like seatand stick as well as various antenna, and other attachments. Thereis a complete breakdown of the metal parts so that you can be sure that you haveall the bits. Most of the smaller bits had broken away from the metal sprues inmy kit so this is very handy to have. There is no construction sequence tospeak of, however, detail areas such as the cockpit, alignment of wings, landinggear installation and the assembly of the contra-rotating prop have been givenseparate detail sections. 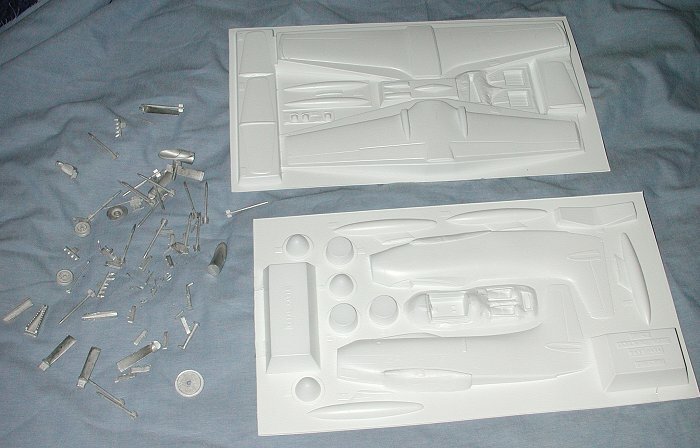 There is also a large three-view showing parts anddecal placement. Speaking of decals, there are markings for three aircraftprovided. All three are quite similar varying only slightly in terms ofpaint or appointments. The large decal sheet does offer a full data suite thatwas so common with these aircraft. While not a kit for thebeginner, those with a reasonable amount of vacuform building experience shouldbe able to produce a superb model. Face it, where else will you get an accurateSkyshark in this scale? If you would like your product reviewed fairly and quickly by asite that has over 1,700 visits a day, please contactme or see other details in the Note toContributors.